As of this writing, March 31, at least 17 Palestinians are dead and more than 1400 injured after Israeli forces opened fire on peaceful protesters gathered at the Gaza border fence with southern Israel to mark the anniversary of Land Day. 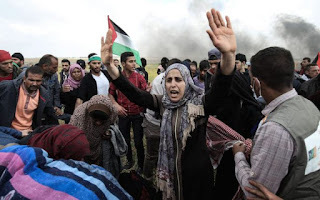 The March 30 protest was to mark the beginning of a 45-day nonviolent mobilization, called “The Great March of Return,” demanding that Palestinians be allowed to return to their lands from which they were expelled or fled when Israel took them over in 1948. The protest is due to end on May 15, the 70th anniversary of the founding of the Israeli state, or the Nakba (catastrophe). On Good Friday, 30,000 Palestinians massed at the border between the embattled Palestinian territory and Israel. In the days leading up to the protest, Israeli military spokesmen promised violence, despite assurances that the mobilization would be nonviolent. Israel massed tanks and troops on the border, including 100 snipers. The attack on the protest included the use of drones to drop tear gas on the protesters. At least one of the dead is a farmer who was assassinated by a tank shell as he worked in his field. There was not a single injury on the Israeli side, illustrating the one-sided nature of this massacre. U.S. media have reported the massacre as “clashes” between Israelis and Palestinians. A clash implies two equally matched forces in conflict. This is an obvious misuse of language to imply violence on both sides in order to justify this criminal massacre. The current situation in Gaza is a human rights disaster. The Israelis have imposed a full blockade on Gaza, restricting access by land, air, and sea. There are only two legal crossing points out of Gaza—Beit Hanoun into Israel and Rafah into Egypt. Both crossings are kept tightly controlled and remain mostly closed with few exceptions. Israeli bombing has targeted infrastructure and destroyed homes, schools, and medical facilities. The blockade makes rebuilding impossible and unemployment is high—close to 50 percent overall and much higher among the youth. Hunger and poverty are rampant. Children, of course, suffer the most. While Israel formally withdrew from Gaza in 2005, their effective clampdown on the territory has turned Gaza into what can only be termed an open-air prison. Moreover, Israel consistently violates the human rights of Palestinians in the Occupied Territories and of the Palestinian citizens of Israel, who are treated as second-class citizens. Earlier this month, the United Nations Human Rights Council condemned Israeli violations of human rights, sparking a backlash from the U.S. foreign policy establishment, which accused the council of bias. Trump’s UN ambassador, Nikki Haley, threatened U.S. withdrawal from the body. The U.S. government, including both major capitalist political parties, consistently provides aid and comfort to Israel. The UN criticized Israel over settlements in the Occupied Territories, saying that settlements are “fundamentally threatening the Palestinians’ right to self-determination.” The UN also criticizes Israel for restricting freedom of movement, violating the right to education, and freedom of religion. Israel is also criticized for attacking the right to access land and water, and for undermining of basic economic rights. These violations of Palestinians’ rights create the framework for the apartheid state of Israel’s attempt to annex the Occupied Territories. Socialists call for the right to self-determination for the Palestinian people. We support the formation of a democratic, secular Palestine with equal rights for all. All political prisoners must be freed immediately. We call for an end to all military and economic aid to Israel and the cessation of all illegal settlement building. We call for Israeli occupation forces and settlers to stop the destruction of crops and homes. We demand an end the occupation and opening the borders of the open-air prison that is Gaza. >> The article above was written by Steve Xavier, and is reprinted from Socialist Action newspaper.